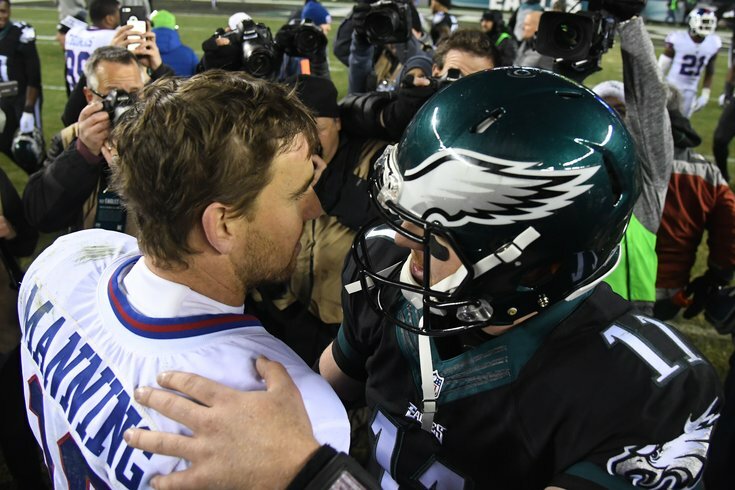 Over the last 10 years, the Eagles are 16-5 against the Giants. Is it a semi-pointless exercise to predict each regular season game's outcome as early as April, a couple days after the schedule was released? Yes, yes it is. Because I'm a hack sellout, let's just go ahead and do it anyway. • Week 1, Falcons at Eagles: Loss. Is Carson Wentz playing in this game? If so, does he trust his knee? Does he have the same mobility? Will he have any rhythm with his receivers after presumably missing all of training camp and the preseason? There are a lot of questions to be answered between now and then. For now, I’m penciling in a loss to a very good, very dangerous, and in my opinion, a very underrated Falcons team. • Week 2, Eagles at Buccaneers: Win. The Eagles will travel down to Florida to play old friends DeSean Jackson, Vinny Curry, and Beau Allen, and they should be able to handle a clearly inferior team. • Week 3, Colts at Eagles: Win. Is Andrew Luck going to be the same player he was before all of his shoulder issues? You know what? Who cares? Whether he plays or not, and no matter how he recovered, this should be a big spread and a comfortable Eagles win because this Colts’ roster is garbage. • Week 4, Eagles at Titans: Win. I’ll admit I’ve clicked on a few schedule prediction posts, and have seen that almost everyone is picking the Titans in this game. I don’t get it. What exactly is everyone seeing in the Titans? Yes they made the playoffs last year, but they did so in an extremely weak AFC. If they played in the NFC, what are they, the tenth best team? • Week 5, Vikings at Eagles: Win. Something tells me that Vikings fans aren’t going to plan a “takeover” of Philadelphia this year. Obviously, this is a rematch of the NFC Championship Game, and I would imagine that by now the Eagles will have found a rhythm on offense. They were able to score on the Vikings’ overrated defense in the playoffs, and they should be able to do the same this year as well. • Week 6, Eagles at Giants: Win. The Eagles absolutely own the Giants in recent years, as they have 5 sweeps over them in the last 10 years, and a 16-5 record overall. Still, Eli and the gang gave the Birds all they could handle in 2017, even in a 3-13 season. Oddly, despite his incompetence otherwise, Ben McAdoo’s quick passing game gave the Eagles fits. With an upgraded staff, the Giants should be better, but a different style of offense should give the Eagles’ defensive line more opportunities to get after the passer than they have in previous Giants matchups. • Week 7, Panthers at Eagles: Win. The Panthers are always a tough team to play, but when I look at their talent verses the Eagles’ talent, it’s hard to find many areas where the Panthers are better. If this game were in Carolina, maybe I’d go that way, but the Eagles have become a legitimately good home team. • Week 8: Eagles at Jaguars (in London): Win. This is another popular game to pick against the Eagles, as many (self included) have acknowledged that the Jaguars have an advantage with their familiarity with playing in London every year. Still, I don’t see the Eagles losing this game. Jacksonville has the exact kind of offense (strong running game, crappy quarterback) the Eagles completely dominated last year. • Week 9: Bye. Holy crap, I have the Eagles going 7-1 so far. That might be a little too bullish. • Week 10, Cowboys at Eagles: Win. The Cowboys are going to see stacked boxes all season long, and it’s going to be difficult for them to sustain drives solely around their running back. Again, this is exactly the type of offense the Eagles match up so well against. • Week 11, Eagles at Saints: Loss. Heading into the playoffs, I saw the Saints as the Eagles’ least favorable matchup. Playing Drew Brees in the dome could be trouble for the Eagles’ secondary. • Week 12, Giants at Eagles: Win. Again, the Giants just aren’t very good, and by this point in the season they’ll be regretting not drafting a quarterback when they had the chance to do so with the No. 2 overall pick. • Week 13, Redskins at Eagles: Win. The Redskins seemed to have the Eagles’ number for a few years, but the Eagles handled them in 2017. Remember how big the Eagles’ Week 1 win over Washington seemed like a year ago? Those kinds of wins became routine. So at this point in the season, the Eagles are now 4-0 in the division, with a sweep over the Giants. They have to lose at least one divisional game, right? You’d think, but I’m having trouble justifying which team in this division will beat them. • Week 14, Eagles at Cowboys: Win. Make it 5-0 in the division. • Week 15, Eagles at Rams: Loss. With the Eagles sitting pretty at 11-2, this feels like a game that the Rams are going to need more than the Eagles for playoff positioning, and let’s be honest – they have a lot of talent. The Birds drop one in L.A. at the scene of Wentz’s 2017 ACL tear. • Week 16, Texans at Eagles: Win. To be determined if Deshaun Watson is still upright at this point in the season. For the sake of an entertaining game, let’s hope so. But again, the Eagles simply have a much better roster. • Week 17, Eagles at Redskins. Win. With losses to the Falcons, Saints, and Rams, the Eagles need this game to wrap up the No. 1 seed, and they take care of business. If you were to ask me how many games I think the Eagles will win this year, I would probably say 11 or 12. Above, I have them going 13-3, like they did in 2017. Too optimistic? Yeah, maybe. Then again, they are the best team in the NFL.